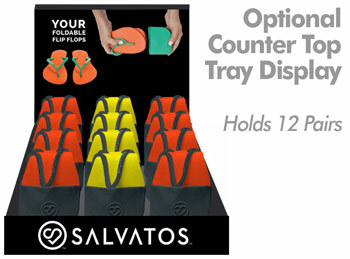 Salvatos - Portable Foldable Packable Flip-Flops - AMAZING Retail for your Pedicure, Spa, Med-Spa or Salon Clients! Salvatos are portable, foldable, packable flip flop with soft durable strap. Salvatos are proven to stay intact fold after fold. Each pair comes with a silicone pouch that fits in most any bag or purse! Compact and light weight. Good after a night out, high heels, as an extra shoe in your bag, after pedicure, gym, a must have when traveling. Salvatos flip-flops are made from high quality materials. A retailable item your clients will be EXCITED to buy! 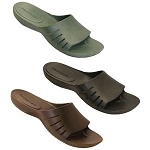 Salvatos are super comfortable flip flops and are recommended for use on a daily basis. Every day, all day. The sole is soft and durable, made of non toxic materials, and designed especially for running around the city. Salvatos are made of high quality materials and unique structure, that allow them to fold easily and to return back into a straight position immediately after wearing them. Salvatos fold into a small silicone case, that was designed for practical use. They weigh only 6.6 oz. (186 grams)! You can carry them around in your handbag and forget you even have them till the moment you need to be saved! Moreover they are very compact and can fit into almost any purse. Eco-Conscious? Oh Yeah! Have limited storage space? Oh Yeah! Love offering your clients Spa Sandals, but hate the waste and cost of disposables? Oh Yeah! Want durable, slippers that are machine washable? Oh Yeah! Want to provide your clients with soft, comfortable slippers that have arch support? Oh Yeah! Want to protect the safety of your clients in wet areas with a non-skid outsole? Oh Yeah! Want to simplify your sandal offerings with Unisex sizes? Oh Yeah!.... If you agreed with the majority of these questions then the Yeah Baby Spa Sandals are the right sandals for your business... and your clients! Make your clients feel like they are walking on air! The Unisex Cloud 9 Spa Slippers deliver a luxurious and comforting fit. The earthy tones make them ideal choice to coincide with any spa atmosphere. They are machine washable and will retain their soft, durable structure even after multiple washings, but if you are looking to be even more energy-efficient, we highly recommend using the Yeah Baby Spa Sandal Cleaner. 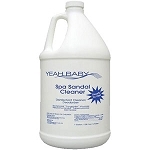 The Yeah Baby Spa Sandal Cleaner is sold either by the Gallon or in 4 Gallon Case/Pack. It is a NATURAL pH germicidal disinfectant that cleans and deodorizes in one easy and cost saving step! Do you Yeah Baby at your spa?